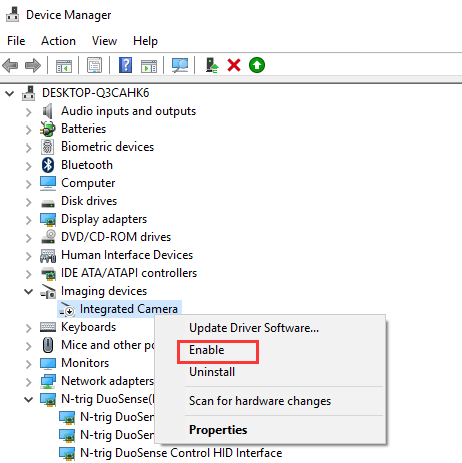 If your integrated webcam is not working since Windows 10 update or upgrade, the problem is likely to be caused by faulty drivers or driver conflicts. 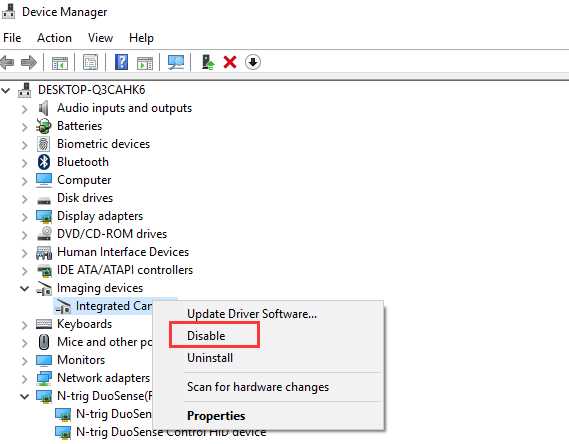 To fix the problem, first, check the driver status in Device Manager. Follow instructions in this post and your webcam should work again. First, go to Device Manager and see if there is a yellow mark next to the webcam device. The device may list under entry Imaging devices or Other devices. If under Other devices, the device name could also be Unknown Device. If you see a yellow sign there, follow guides below to fix the problem. If not, proceed to Instructions for the device with not yellow mark on it. 1. 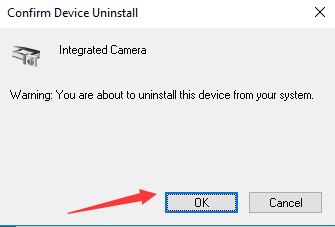 Right-click on the device and select Uninstall on the pop-up context menu. Following screenshot is for your reference. 2. Confirm Device Uninstall window will pop up. Click OK button to apply the uninstall. 3. Reboot your computer. 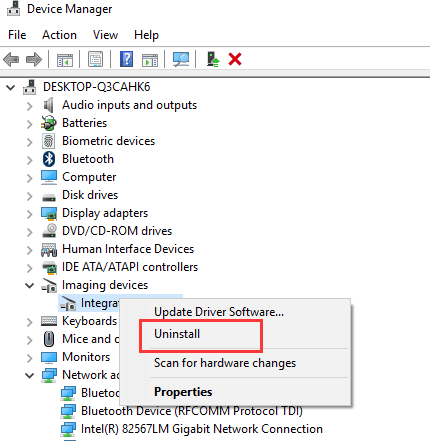 After rebooting, Windows will reinstall the driver automatically. If Windows does not install the driver automatically, download and install the latest driver manually. 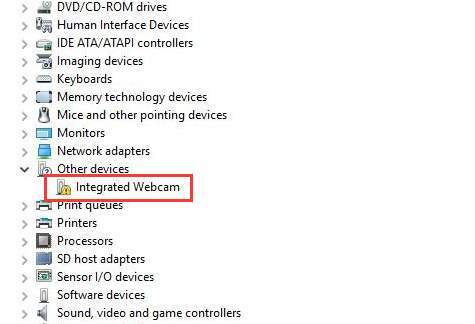 Go to your PC manufacturer’s website to download the latest Windows 10 driver for the integrated webcam. Before you get started, ensure that you know the PC model and the specific operating system that you are using (See How to Get Operating System Version). 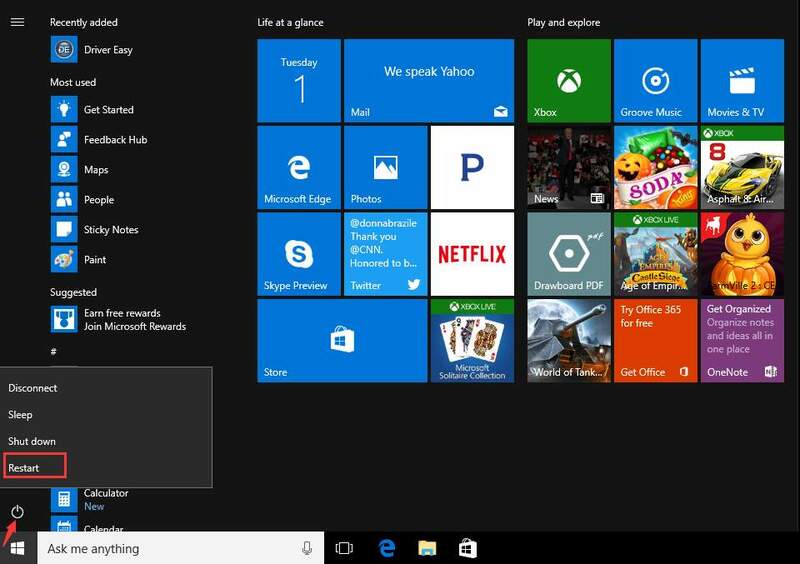 For some PC models, the manufacturer may not release Windows 10 driver. If you are in this situation, download the driver for Windows 7 or Windows 8, which is always compatible with Windows 10. Usually, the downloaded driver file will be .zip file or .exe file. For .zip file, extract it completely then you will get the .exe file. To install the driver, just double-click on the .exe file and follow the on-screen instructions. 1. 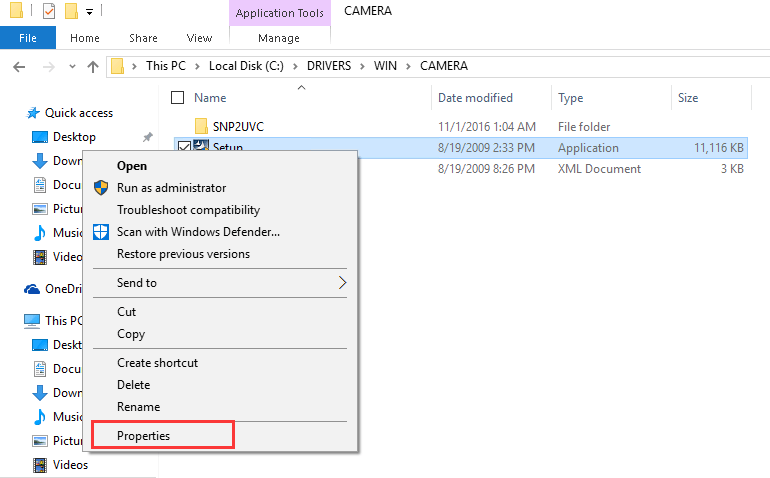 Go to the webcam software program folder and find the executable file (.exe). 2. Right-click on the file and select Properties in the pop-up context menu. 3. 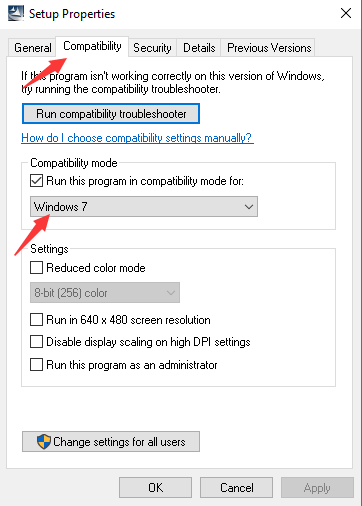 Go to Compatibility tab and change the Compatibility mode to Windows 7 (See following screenshot). After that, click Apply and OK button to apply the changes. 4. Install the driver again. If you have difficulty downloading and installing the driver manually, you can use Driver Easy to help you. 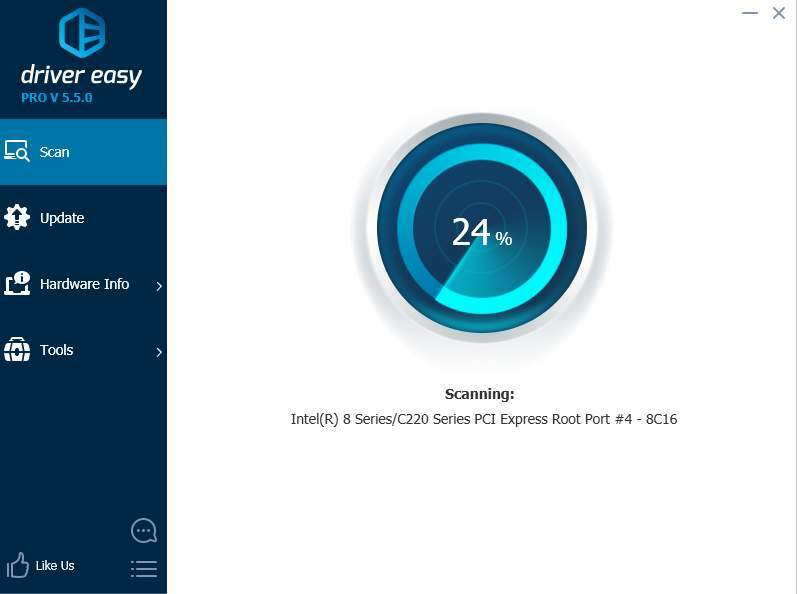 Driver Easy can scan your computer to detect all problem drivers in several seconds, then give you new drivers. It has Free version and Paid version. With Paid version, to update drivers, all you need to do is click your mouse 2 times. Moreover, you can enjoy professional tech support guarantee, you can contact us for further assistance regarding the integrated webcam not working issue. To resolve the problem, use Driver Easy as your final solution (Recommended). 1. Right-click on the device and select Uninstall on the pop-up context menu. 2. Right-click on the device again and select Enable on the pop-up context menu. If the problem persists, you might need to reset the computer. 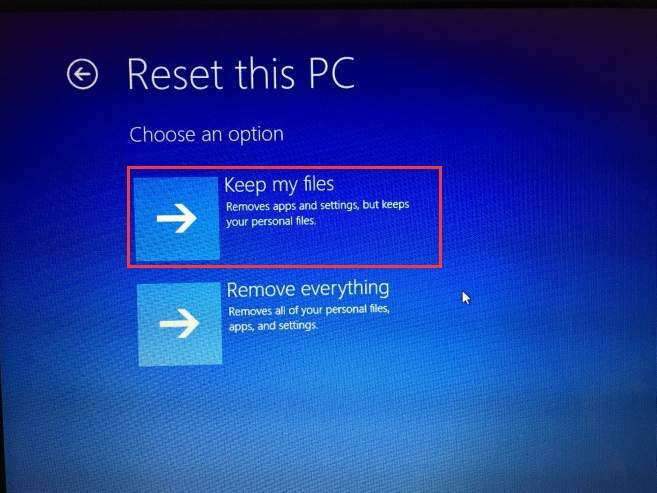 Note while performing reset, ensure to select Keep my files so that your personal files will be saved. 1. Click Start menu icon in left bottom corner. 2. Click on Power button, hold down Shift key and click on Restart. Make sure you hold the Shift key down when Windows is restarting and don’t release it until you see the following screen. 4. 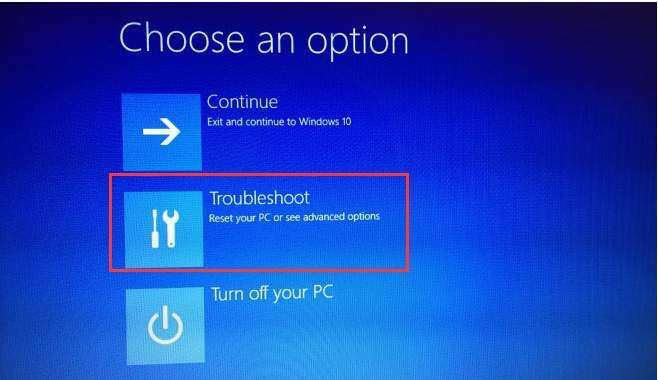 Select Reset this PC. 5. Select Keep my files.